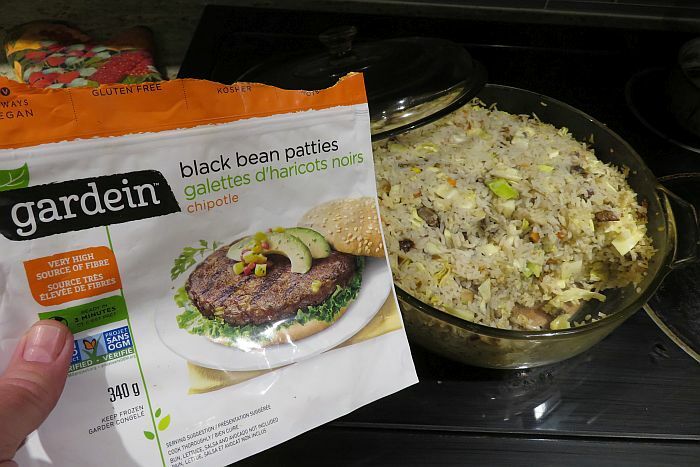 So in my reducing-the-eating-of-meat process, a friend recommended Gardein veggie burgers. I inadvertently bought what is likely their spiciest product — Chipotle Black Bean patties. I am not a spice person, and nearly died eating the first two patties. Cook a bunch of long-grain or jasmine rice only about 2/3 done. Mix with chopped cabbage, carrots, mushrooms, crumbled chipotle black bean veggie burgers, whatever, in a large casserole and mix in a can of mushroom soup. Bake in the oven for an hour or so (the rice will finish cooking without becoming overly soggy).. Still a tish on the spicy side, but edible for a wuss like me .